On 7/9/16, ECCG members visited Ballycotton Lifeboat Station in the East Cork harbour town. The wet weather quickly put paid to our grand plans for a shoot however so, after a tour of the lifeboat itself, RNLB Austin Lidbury, we adjourned to the station for a welcome cuppa. 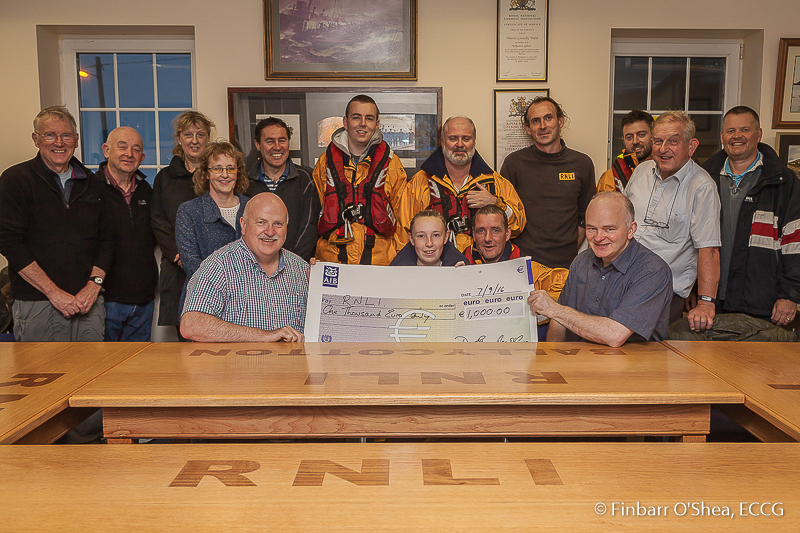 During our visit we were delighted to present the Lifeboat Crew with a cheque for €1,000.00 for the RNLI which was generated through our Cruise Liner / Lusitania exhibitions in Cobh and Aghada earlier this year. Thanks to the crew for a wonderful visit and great tour. See some images from the visit here. Enjoy! This entry was posted in Shoots and tagged Austin Lidbury, Ballycotton, Lifeboat, RNLI by Denis Barry. Bookmark the permalink.